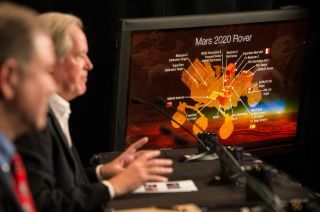 Michael Meyer, lead scientist for NASA's Mars Exploration Program, discusses the science instruments that will ride on the agency's next huge rover on the Mars 2020 mission during a press conference on July 31, 2014 at NASA headquarters in Washington. NASA's next Mars rover will feature lasers, ground-penetrating radar and other high-tech science gear designed to help it snag samples of the most interesting Martian rocks for eventual return to Earth. The U.S. space agency announced today (July 31) that the new car-size rover will carry seven instruments when it launches toward the Red Planet in 2020. The different parts of the science payload are designed to work together to identify rocks that have the best chance of preserving evidence of past life on Mars, if it ever existed, officials said. Examining Red Planet material in well-equipped labs here on Earth is the best way to search for signs of Mars life, scientists say. This NASA graphic outlines the seven instruments riding on NASA's Mars Rover 2020. The space agency unveiled the science instrument package of the ambitious rover on July 31, 2014. The 2020 rover will follow in the wheel tracks of NASA's Curiosity rover, which touched down in August 2012 to determine if Mars could ever have supported microbial life. Curiosity has already achieved that goal, finding that an area near its landing site was indeed habitable billions of years ago. But NASA wants the next rover to go a step further. Last year, the mission's "science definition team" recommended that the 2020 rover search for biosignatures, cache samples for potential return to Earth and advance the space agency's goal of putting astronauts on Mars. "It was kind of a tall order," Meyer said. But, he added, "we've been able to put together a great payload that actually meets or exceeds all the measurement requirements that this science definition team laid out 13 months ago." Like Curiosity, the 2020 Mars rover will have six wheels, weigh about 1 ton and land with the aid of a rocket-powered sky crane, NASA officials said. But while Curiosity totes 10 science instruments, its cousin will sport just seven. The rover will also carry two science instruments on its robotic arm — PIXL (Planetary Instrument for X-ray Lithochemistry) and SHERLOC (Scanning Habitable Environments with Raman & Luminescence for Organics and Chemicals). NASA's Mars Rover 2020 mission will borrow its basic design from the Mars rover Curiosity currently exploring the Red Planet. The Curiosity rover, which landed on Mars in 2012, is about the size of a Mini Cooper car. PIXL, an X-ray flourescence spectrometer that also features a high-resolution imager, will allow mission scientists to perform fine-scale investigations of Martian rocks, officials said. SHERLOC is a spectrometer that will enable detailed study of rocks and, like SuperCam, also potentially detect organics. The 2020 Mars rover's body will house the other three instruments, which include a high-tech weather station called MEDA (Mars Environmental Dynamics Analyzer), a ground-penetrating radar system called RIMFAX (Radar Imager for Mars' Subsurface Exploration) and MOXIE, which is short for Mars Oxygen ISRU Experiment. MOXIE is designed to produce oxygen from Martian air, which is rich in carbon dioxide, demonstrating technology that could be useful for human explorers on the Red Planet. "If you can actually cache and put oxygen in storage tanks before the crew even arrives and you know they have a habitable environment and place to go when they get there, that's tremendously important to us," said Bill Gersteinmaier, associate administrator for the Human Exploration and Operations Mission Directorate at NASA headquarters. MOXIE "will buy down the uncertainty of that," he added. "It'll make sure that we understand the risks associated with that, and we can do the appropriate planning as we move forward for human missions." The 2020 Mars rover will also feature a coring drill, which will collect samples of rocks flagged as promising by the robot's instrument suite. It's unclear at the moment where these samples will be stored; they may be carried on the rover or placed on the ground somewhere, officials said. The goal is to eventually get those rocks back to Earth, where scientists all over the world can pore over them to search for signs of Mars life. This job is too difficult — and too important — to entrust to a robot all by itself on the surface of another world, NASA officials said. "As Carl Sagan said, extraordinary claims require extraordinary evidence," said John Grunsfeld, associate administrator of NASA's Science Mission Directorate. "It's really going to be when we have the best analytical instruments, and our ability to interrogate these samples at the smallest scales with the best instruments, that we may really then be able to say for sure whether or not Mars once had life." There's no concrete plan at the moment for bringing the samples back; no such return mission is on NASA's books. But properly sealed samples could be stored for 20 years or so on the Martian surface, Meyer said, so there's still time to figure out how to get them to Earth. "I wouldn't rule out the possibilty that it's future astronauts that pick up the sample and bring it back to Earth," Grunsfeld said. "But that's forward work. We haven't defined that."